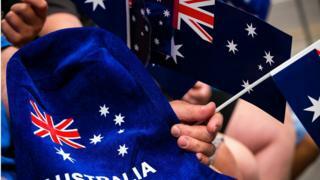 An Australian government plan to overhaul its citizenship process has stalled after opposition parties effectively blocked its Senate passage. The proposed bill would have made it harder to gain citizenship. It included requirements for applicants to have advanced English language skills and four years of permanent residency. Opponents argued the requirements were too tough on non-English speakers. PM Malcolm Turnbull's government says it will make amendments to the bill. Late on Wednesday, a Senate deadline expired after Labor, the Greens and the Nick Xenophon Team signalled they would not support the bill in its current form. Labor said a demand on applicants to pass university-level language tests had the potential to create an underclass of non-citizens. What exactly are 'Australian values'? Immigration Minister Peter Dutton said the government would negotiate with independents and minor parties on an amended bill, including possible changes to the requirements concerning English. "We believe very strongly that the proposal we have put forward is moderate, it is sensible," Mr Dutton said on Thursday. The government said in April that the overhaul would ensure that migrants are better integrated and committed to Australian values. It also announced stricter requirements on foreign worker visas. Those changes are already in place.